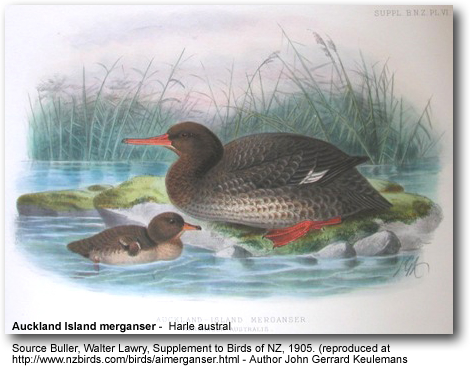 The Auckland Islands Merganser, Mergus australis, is now extinct. It previously occurred on the South Island and Stewart Island in New Zealand. Its extinction is attributed to hunting and predation by introduced mammals. This duck was described as shy and typically hid between rocks when pursued. The first specimen was collected when a French expedition led by the explorer Jules Dumont d'Urville who visited the Auckland Islands in 1840. The last sighting was recorded to have occurred on January 9, 1902. The Auckland Island Merganser male had a bluish black mantle (back) and tail, a dark reddish-brown head, crest and neck, and slate grey wings. The female resembled the male, but was slightly smaller and had a shorter crest.